Each year, more than 3 million cats and dogs are euthanized at U.S. animal shelters. That's about half of all cats and dogs that enter shelters. And you can bet someone's beloved Fluffy or Fido is among those that suffer the avoidable fate of euthanasia. What if there were a way to prevent these tragic deaths? Imagine the glee of a grieving pet owner when the shelter calls to say it's found little lost Fido. Microchip technology makes more of these emotional reunions possible. Some pet owners are squeamish about idea of a microchip implant. You might worry that it will be a painful procedure for the animal. But it's not. The procedure doesn't even require anesthesia. The pet won't suffer at all from the implantation -- or at least as little as one might suffer from a routine shot. 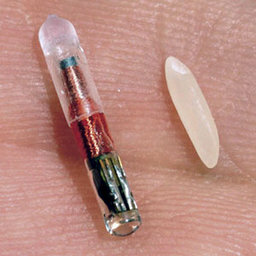 Watch the video below to see a microchip implanted. PIONEER ANIMAL HOSPITAL encourages all pet owners to have their cats and dogs microchipped. Our staff checks every patient entering our hospital to verify their microchip. Maybe you have just gotten your pet and don't know if they are microchipped or not. We are happy to check them for you. We have partnered with AKC Reunite to microchip PAH client pets with the highest quality chip at the best value. Unlike other microchip monitoring services, PAH's AKC Reunite requires no annual memberships, no annual charges. Who doesn't love that feature?